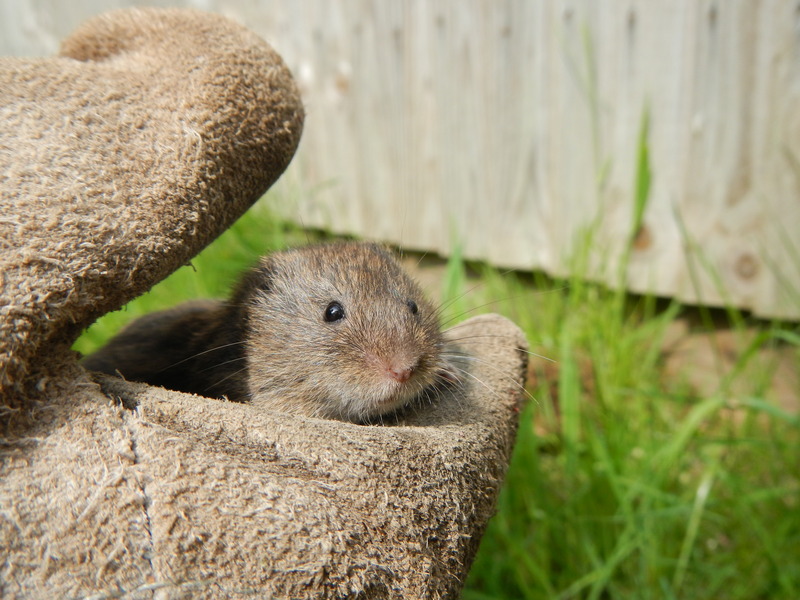 I was wrong when I said that DP would be the last vole I would catch for a long time, because that Friday my Longworth trap arrived in the post! I was really eager to put it outside, though I knew that I had to put it in prebait first. Assembling it and prebaiting it is easier said than done. There are all sorts of wires and sticky-out bits, though within 15 minutes I had prebaited it and I was ready to make it fit for a vole. I put in some bedding, then some of the bird seed which the Bank Voles usually feed on and a carrot. 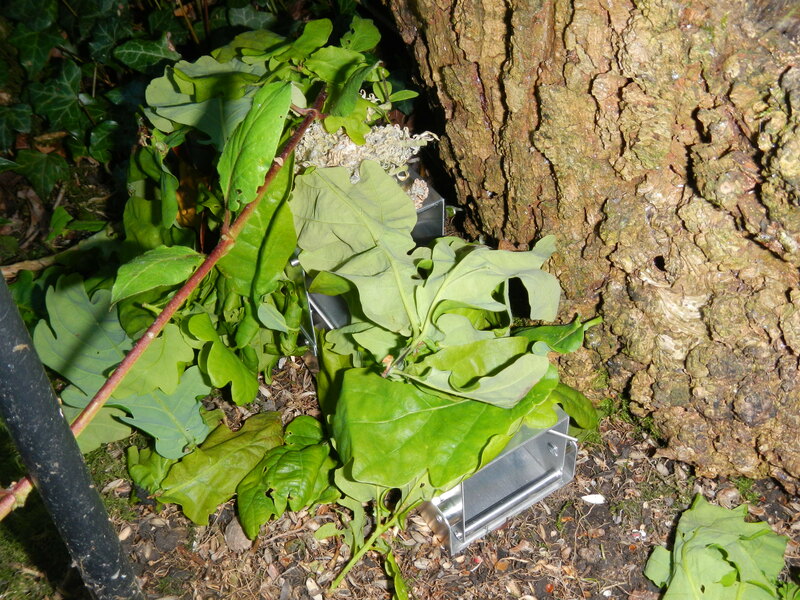 I put it out by the bird table, where voles usually pass, and covered it with Oak leaves. While I was collecting Oak leaves, I discovered that there were a few Currant Galls on the underside of some leaves, a nice surprise! The next Saturday evening, I decided to set it properly! I fiddled with a few more wires and eventually it set, I really couldn’t wait until the morning! I woke up on Sunday morning at six o’clock, I was so eager to check it. As soon as I could, I raced downstairs and one of the first things I did was check the Longworth Trap. The door was closed! The Longworth Trap is closed! Another surprise happened that morning, just as I was about to check the trap another young Bank Vole ran beneath my legs! I’m starting to feel that the bird feeder is overrun by Voles! I did eventually check it and I was relieved to find that there was a Vole inside! I had bought a bigger plastic bag so that when I opened the Longworth Trap, I could open it inside the plastic bag. 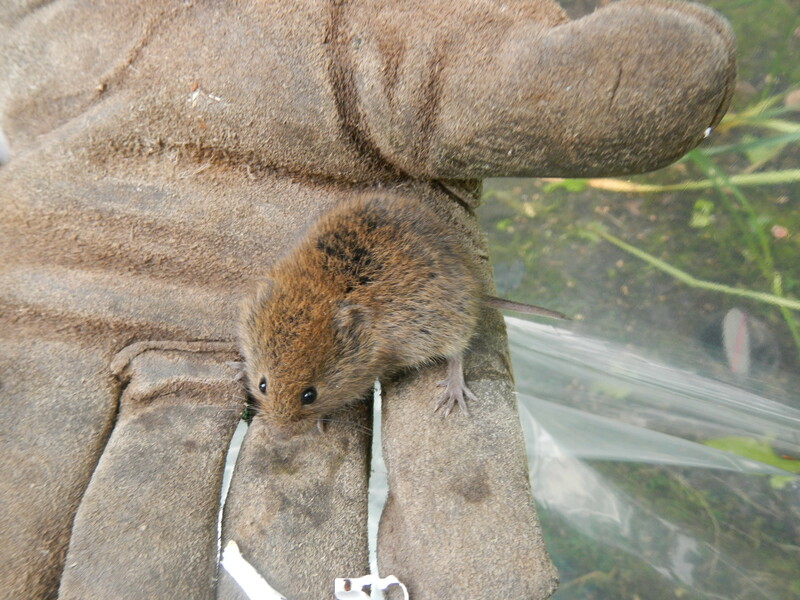 I found a female Bank Vole inside the trap and it looked about 2 months old. 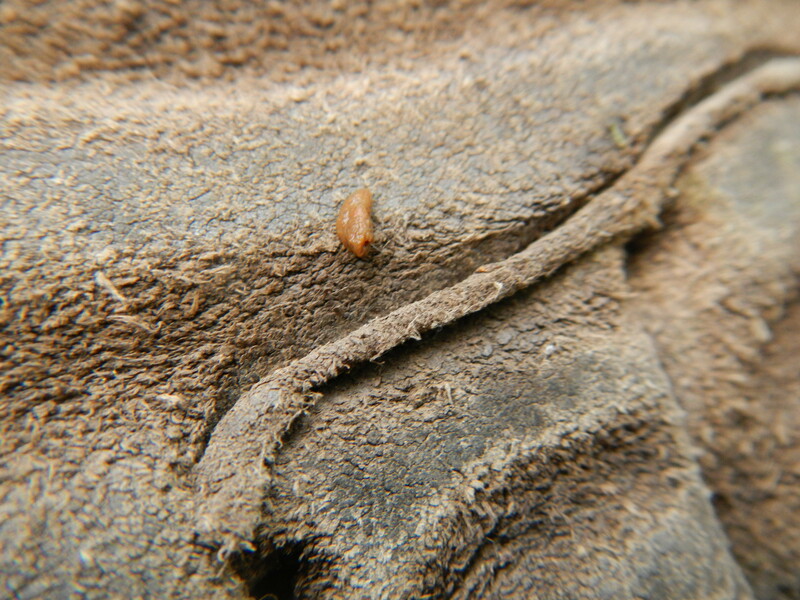 I quickly marked it and measured it, though just as I was checking what gender it was it egested faeces onto Peter’s glove! I set it again after that and at about three thirty, I saw that the door was shut again. The trap revealed another female Bank Vole, and adult this time, considerably larger than any of the other Bank Voles I have seen. It was very squirmy, though after some time we eventually got it to sit still to take some photographs. I’ve set it again now, and now I’m just waiting for another inquisitive vole to wander inside…. 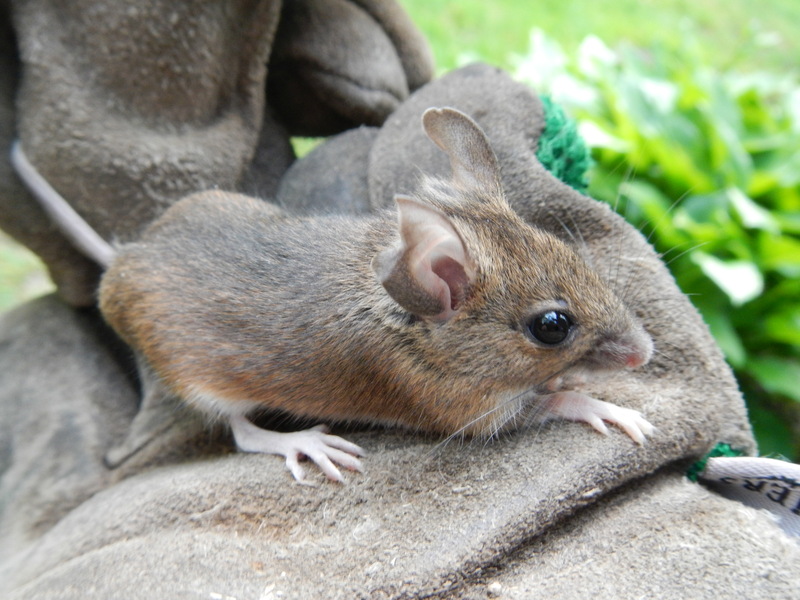 Ever since I read the Mammals section in The New Amateur Naturalist, I have been obsessed with trapping and recording small mammals. 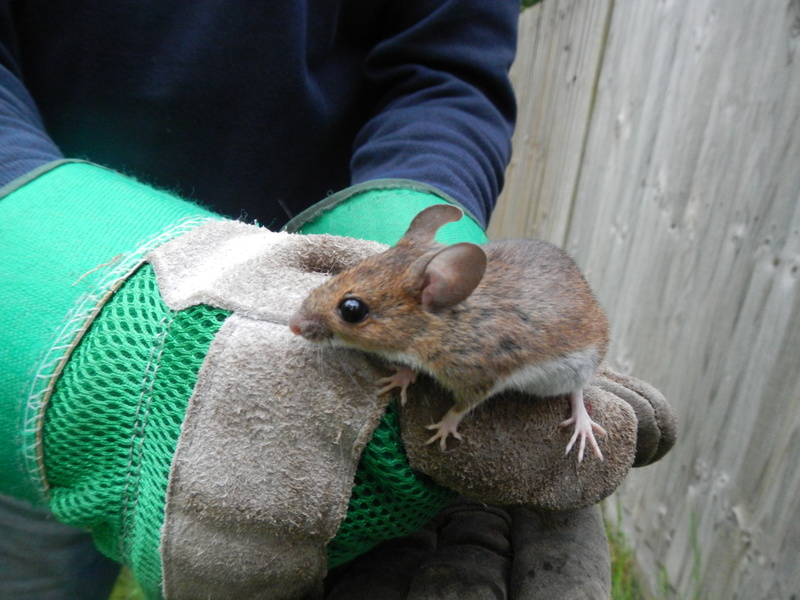 So much so, that I have decided to set up a project about recording and marking all the small mammals in our area, calling it the New Domewood Small Mammal Project. I decided to start as soon as I had finished reading the book, though the problem was that I wasn’t that good at DIY and I didn’t really have much money to invest in a Longworth Trap. 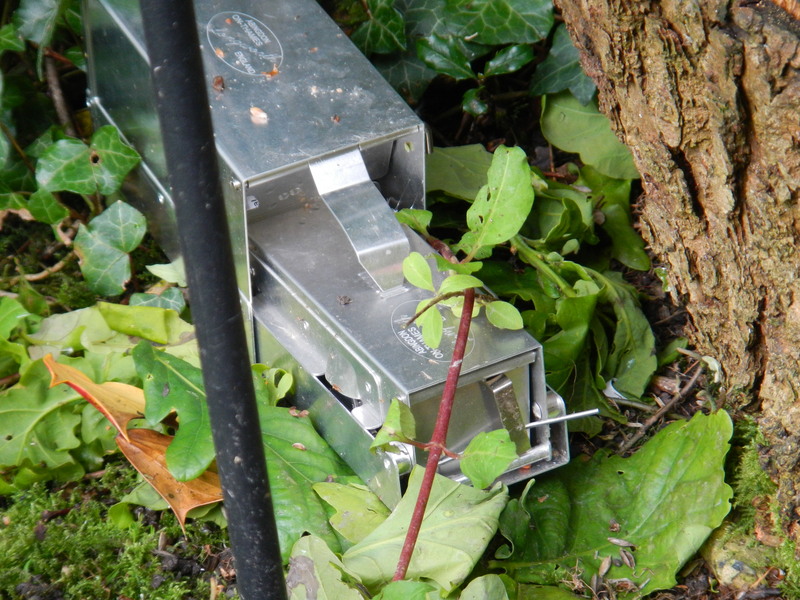 The Longworth Trap would have been the quickest and easiest way to carry out this project, though it was quite expensive, with prices up to £62. Despite lacking skills in DIY, I decided that making a homemade pitfall trap for mammals would probably be my only option at this point. To start with, I tried to find a smooth sided vessel, though all I could find was a plastic cup with a ridge around the middle. Things were going wrong already! Then we needed to find a lid, with a pivot to go with it. The closest we got to a lid was a small piece of cardboard, but we couldn’t find anything that would work like a pivot. So we used a thin piece of tape. We made a hole just outside an entrance to a Bank Vole burrow and placed the ‘pitfall trap’ inside. I doubted that it was going to work and I was right. Either I was too stupid or the Bank Voles were too clever, but the first try revealed that they were too large to fall into the trap. Plan B was to get rid of the lid and just to cover the hole up with moss and sprinkle seeds on top. But as the voles were reaching for the seeds, they dislodged the moss and saw that there was a hole there then scurried back into their nest. Then they regrouped and tried to make a plan to get to the seeds that were still on top of the trap. They are obviously really intelligent mammals, because their plan was to pull the moss over the trap, with the seed still on it, to the other side of the trap. Soon all the seeds were gone. My plan C was to only place the seeds at the back of the trap, where the voles can’t reach. 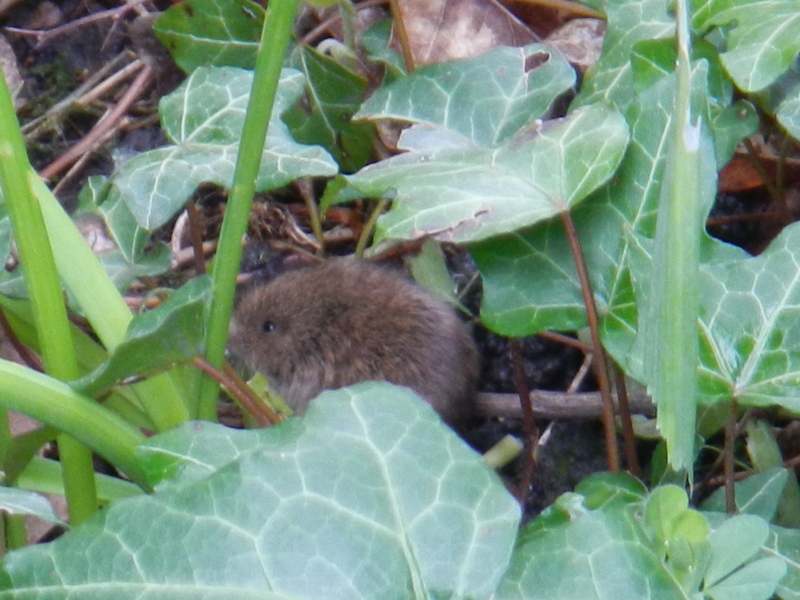 Finally I had my luck, a vole fell in. But then guess what happened, the vole climbed out again!!! By then it was the end of the day, and tomorrow I had to go to school. But when I came back, I was surprised to see a new and improved trap, made by my dad while I had been away! The trap had a proper smooth sided vessel, with no ridge and was twice as deep as the previous trap. It also had a pivot, the end of a sparkler! This was plan D! We waited for the weekend to come before I put the trap out, because then I could watch it the whole day. 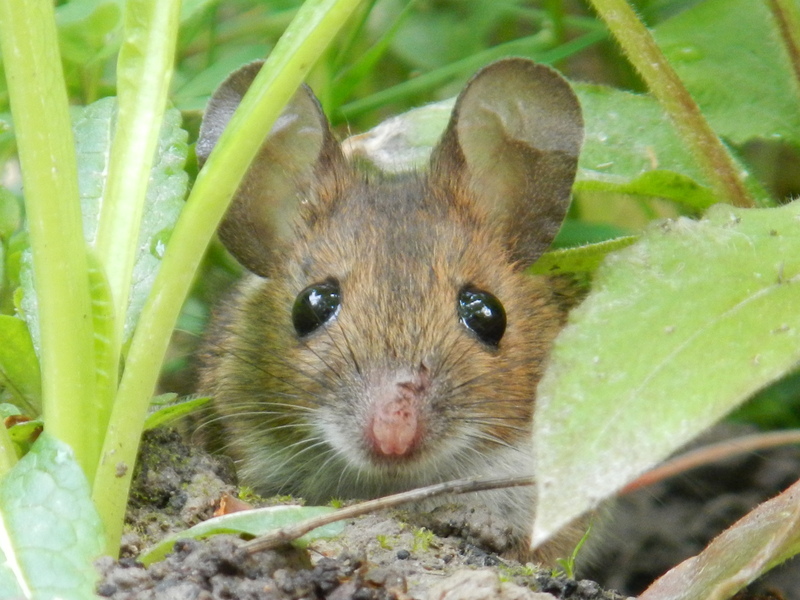 When Sunday had arrived, from watching the burrow all day, I discovered that some baby Bank Voles had been born and had been taking there first steps outside. By then I was also so frustrated that the pitfall trap hadn’t worked, that I decided to just catch the voles myself, with just a plastic bag! After around 3 minutes of watching the most used entrance to the burrow, I glimpsed a baby Vole clumsily toddle out of the burrow, just a metre from my knee. It was so small that I hardly even noticed it before it clumsily walked back in again! It then half ran half walked over to the other side of the bird table, where it got stuck in a tree root. It was able to get free though, and when it did, I was ready to catch it. I gently placed the plastic bag over its head (it still had lots of air to breathe) and then tilted it slightly. 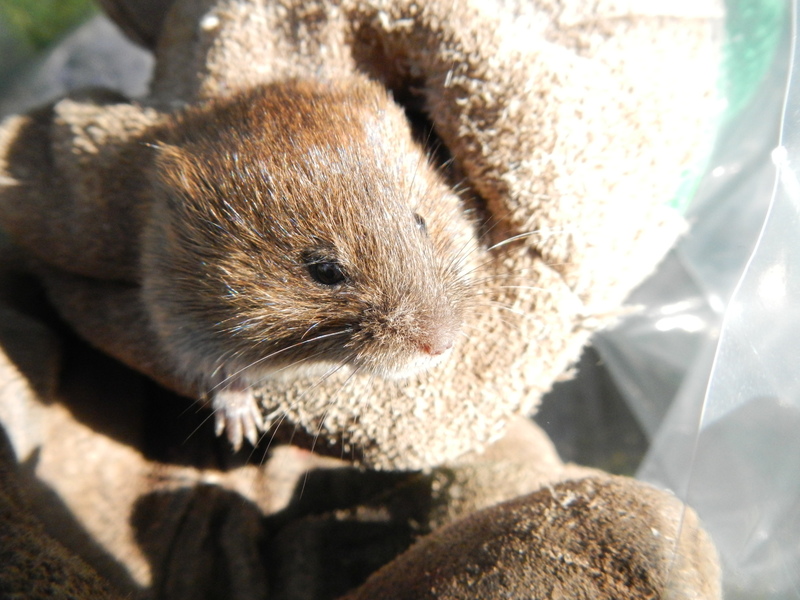 Obediently it crawled to the other end of the bag: I had caught my first Bank Vole! After I had assessed it and examined it, I let it go where I found it. The next weekend, I put fresh seeds in the middle of the trap, with out any moss this time, so a vole would have to go right to the middle of the trap to get the seeds. 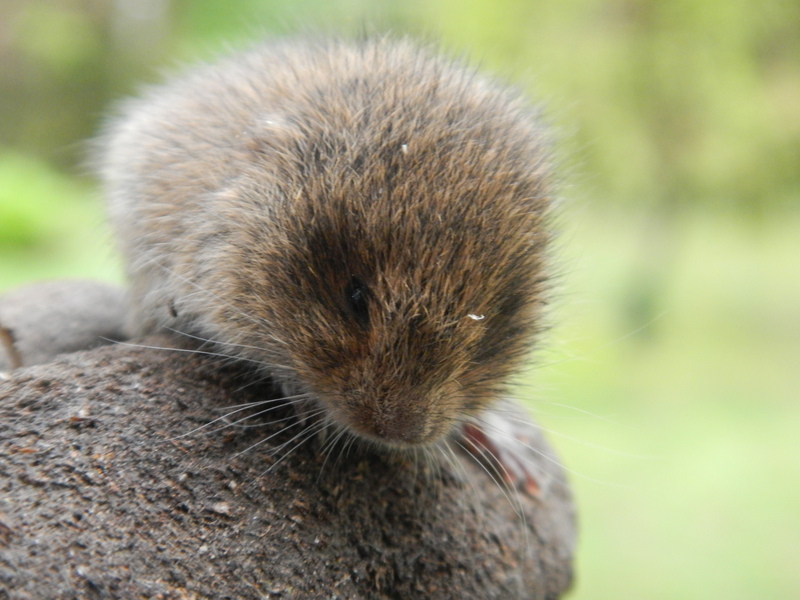 I was so relieved when another young bank vole tried to get to the seeds, even more so when it actually fell in!!! It was surprisingly calm when I saw it in the trap. It just raised its head to acknowledge me, then carried on eating the seeds that had fallen to the bottom of the trap! I did have to assess this one though, so my dad and I emptied the trap into the plastic bag and I took some photos. 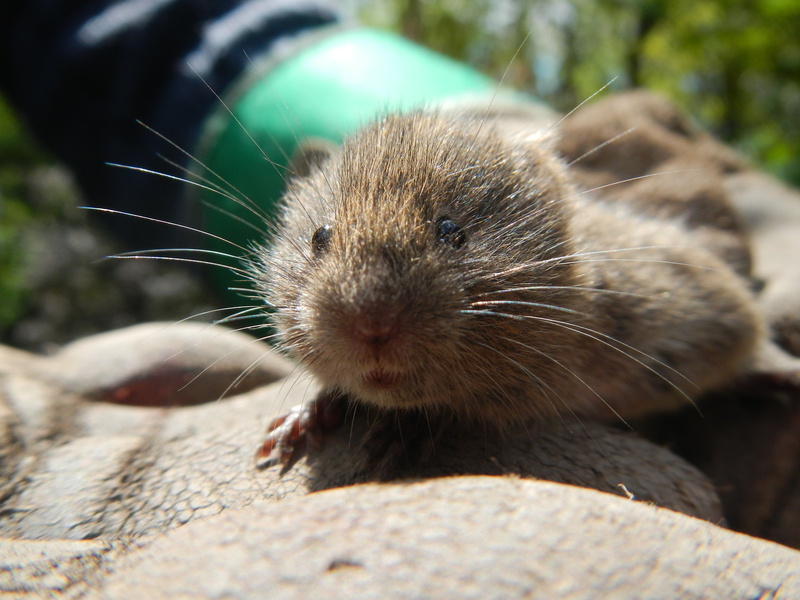 This was a male bank vole, and I named him DP for dark patch, because he had been sitting in a puddle.